Just about any “what car should I buy?” question on the Grassroots Motorsports online forum receives the same answer: the Mazda Miata. It’s the most popular car owned by GRM readers. We’ve had a bunch of them as project cars through the years, and currently have more than half a dozen in the fleet. So, what’s the fuss all about anyhow? Well, it’s been credited with single-handedly saving the open-top sports car, paving the way for the Porsche Boxster, BMW Z3 and Honda S2000. It’s won countless autocrosses and road races, has a highly successful spec road racing series and has even been victorious at one of our Challenge events. Although the Miata seems like an obvious answer in today’s world, in the late 1980s the sports car market was looking pretty dismal. There was the Toyota MR2 providing affordable mid-engined entertainment, but few options existed for those who thought a “sports car” equaled an inexpensive front-engined, rear-drive convertible. The Alfa Romeo Spider was essentially a brand-new vintage car; the Mustang convertible offered power, but wasn’t exactly light-footed. In 1984, Mazda held an internal design study for a project called the Light Weight Sports. Three proposals were created: a mid-engined coupe that anticipated the upcoming MR2 quite nicely; a front-wheel-drive “CRX killer;” and a front-engine, rear-wheel drive roadster from the California studio. The roadster got the nod as the most viable choice—and that was pretty much as far as things went. But thanks to a group of enthusiasts working inside Mazda, the project wasn’t allowed to die. A running prototype was put together and shipped to Japan—but not before it took a day trip around Santa Barbara. As locals chased after the car to find out what it was and who made it, Mazda realized that their Light Weight Sports would be a hit. Boy, was that right. The car was exactly what enthusiasts had been hoping for. Underneath the cute body was a chassis that had been laid out for drivers. Instead of taking the easy way out and adapting an existing strut suspension to the car, Mazda’s engineers gave the car a fully adjustable double-wishbone suspension on all corners with a design that kept close control over roll centers. To attain a near-perfect weight distribution, the battery was installed in the trunk and the hood was made from aluminum. The weight was kept to 2116 pounds at the cost of thin body panels and a cheap-feeling interior. Even the originally eight-spoke Minilite-style wheels lost a spoke to save 300 grams per corner. Obsessive, perhaps, but obsession can be a good thing sometimes. An aluminum Power Plant Frame turned the entire drivetrain into a solid unit, linking the transmission to the differential. The transmission was a jewel, with the shortest throw in production. The engine was a development of the robust B6-spec 1.6-liter four that had seen use in the 323 GTX. This twin-cam B6-ZE unit was not terribly powerful, with only 116 horsepower and 100 lb.-ft. of torque, but it was well matched to the rest of the car and had camshafts designed to reward high revs. The summer of 1990 was nuts. The automotive press couldn’t say enough good things about the new Miata, and the public couldn’t seem to buy enough of them. Supply was nowhere near enough to keep up with demand, and dealers laughed all the way to the bank. The list price of $13,800 was viewed as merely a starting point, and to own a Miata was to become a minor celebrity. While many dismissed the cute little roadster as a girlie car (and many girls agreed that it did just fine that way, thank you very much) Miatas very quickly found their way to race tracks. That suspension turned out to work extremely well, and the car’s nimble handling and small size made it a giant-killer on a lot of tracks. The first national victory came in 1992 when a Miata won the Showroom Stock C title at the Runoffs. It won again in 1993. And in 1994. The Miata didn’t win the SSC title in 1995 because it had been reclassed to Showroom Stock B—so it won that category instead. The Miata caught its breath in 1996 with a second-place finish, and resumed its Showroom Stock streak until being unseated in 2004. That’s 11 championships in 12 years. Autocrossing wasn’t much different, with the Miata proving to be tough competition in a variety of classes. From 1993 to 1997, the car claimed 12 class titles at the Solo II Nationals. Increasing safety and emissions standards along with tougher market competition led to a minor update of the model in 1994. The B6-ZE engine was replaced with the similar BP-ZE, bumping the displacement to 1.8 liters and power to 128 horsepower. The ring and pinion were enlarged along with the brakes, and a Torsen torque-biasing differential became available. Weight swelled to 2293 pounds, while enthusiasts applauded the jump in torque. For the racers, the R package was also introduced. The R came with the Torsen, a more race-ready suspension that had a 20mm front anti-roll bar, stiffer spring rates and Bilstein shock absorbers, and manual steering. By the end of 1997, total annual Miata sales had dropped to under 17,000 in the U.S. from a high of around 50,000 that first year. The Miata had been little changed since the summer of 1989. The Mazda bank account was a little low, so there wasn’t enough money for a full redesign. They gave it a good shot, though, and 1998 saw the introduction of the second generation car as a 1999 model. This was known internally as the NB model, while the earlier cars were the NA. Suspension geometry was subtly tweaked to improve rear travel, decrease bumpsteer and improve compliance. The engine was given a new head and a variable intake system that pushed output to 140 horsepower. The chassis was stiffened with some modifications to the structure. The transmission—still regarded as one of the best in the world—even got some attention to improve the 1-2 shift in cold weather. Close attention to detail meant the new car came in at a bit more than 2300 pounds, distributed in a perfect 50/50 split. From the outside, the car was obviously a Miata, but it had exposed headlights (12 pounds lighter) and a more muscular-looking body. The 10th Anniversary Edition was also available for 1999 and introduced a new six-speed transmission that became more widely available in 2000. The new body style wasn’t as long-lived as the original, as 2001 saw a few more changes with a face-lift. Under the hood, there was the addition of variable intake valve timing. Power was essentially unchanged, but the engine was smoother and cleaner. The Sport Package introduced larger brakes front and rear, factory 16-inch wheels and substantial under-car bracing that made things noticeably stiffer. Enthusiasts had been calling for more power for years, and the aftermarket had shown that the engine was strong, willing to accept forced induction, and that the chassis could easily handle it. The 2004 Mazdaspeed MX-5—the Miata name was absent—was Mazda’s answer. The engine was given an IHI turbocharger, which boosted power to 178 horsepower. The Sport suspension that had first been used in 1999 was installed underneath, along with the big brakes and bracing that had become standard in 2003. A special interior and body colors, along with 17-inch Racing Hart wheels, rounded out the package. Unfortunately, power delivery was lagging, and Dodge’s SRT4 made the Mazdaspeed MX-5’s horsepower look inadequate. The Mazdaspeeds sat around the lots, and when a fire halted production of the 2005 models early, Mazda didn’t bother to restart the line. After all, there was a shiny new 2006 on the way. The 1990-‘93 Miata are the most common and the most affordable. They’re also the cheapest, starting as low as $2000 for one in reasonable condition. We have bought decent runners for as little as $1100. Mechanically, early Miatas are all pretty much the same other than the crank design on the 1990-‘91 models. Many people are scared by this weak spot and will only consider the 1992-‘93 “long nose” cars. There were a number of limited editions from 1991-‘93 that will affect the price, but these were primarily just special colors. The one exception was the 1993 LE, a black car with a red leather interior. This car came with the Bilstein suspension that was later used on the R package models. It also came with the lightest wheels ever delivered on a Miata, a skeletal 9-pound model. Special edition cars command a premium in the market, so don’t shell out for a 1992 yellow unless you really have to have the look. The 1994-‘97 cars are considered by many enthusiasts to be the best for modification. The engine has more power potential, the ring and pinion is much stronger, a Torsen differential became available, and the prices are still quite reasonable. The biggest change during this period was the introduction of OBD II onboard diagnostics for 1996. This can cause complications for emissions testing if lots of modifications are planned, but the engines do make an extra 5 horsepower. The M edition cars from 1994-‘97 were a series of special colors with all the options and, often, different wheels. The 1995 model came with super-rare 15-inch BBS wheels that weighed in at 11.6 pounds each; the center caps for these wheels are worth their weight in gold. From a racer’s viewpoint, the R edition is the one to have. Available in decreasing numbers from 1994 to 1997, these cars had a functional front air dam, manual steering, minimal options and the Torsen. The suspension was tweaked with slightly stiffer anti-roll bars and Bilstein shocks. Thanks to the stiff ride—called harsh by many—and a lack of options, these cars often sell for less. You can spot an R by the black front air dam, trunk lid spoiler and the yellow shocks. Since there is no actual R badging, these cars will likely not be advertised as such unless they’re being sold by an enthusiast—in which case the price will likely be higher. A 1994-‘97 car in good condition will range from $4000 and up. The M editions usually command a $1500 premium. 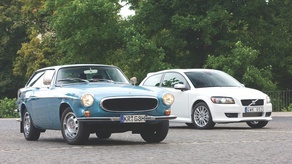 The 1999 and later cars are still relatively new, so prices are higher. It’s a good idea to check the crank end-play on these cars as there were some early problems with thrust bearings. Finally, there are some mechanical reasons to look at the special editions as well. The 10th Anniversary Edition sold in 1999 introduced a Sport suspension that was viewed as the best handling suspension put on a car by the factory. This car also introduced a six-speed transmission. You have to like blue to drive one of these cars, however, and they command a premium thanks to the numbered badge on the side. Subsequent special editions had similar equipment levels. The Sport suspension was an option on all 1999-2005 Miatas and can be spotted by yellow or gray shocks. Starting in 2001, the Sport cars also came with larger brakes and 16-inch wheels from the factory. A hardtop has always been available for the Miata, but due to the rise of Spec Miata racing, these roofs have become highly sought-after. The top on its own is worth about $1000 in good condition, so it can be very worthwhile to pay a bit more for a car that comes with one. The model year of the top does not matter, other than for the defroster. A high percentage of Miatas are modified. This can mean some excellent bargains, so it’s a good idea to bone up on what modifications are desirable. It’s always a good idea to know exactly what’s on the car. This is particularly true of forced induction kits, as there are a couple that no longer have parts available. Where can you road race a Miata? The most obvious answer is Spec Miata. This hugely popular series has driven up the price of ratty Miatas as hundreds have been converted to racers. While the upper echelons of the series are expensive to beat, it’s still possible to have some very close racing on a relatively tight budget—and even in a road-legal car. NASA, the SCCA and many regional clubs welcome the class. Many Spec Miatas also take part in endurance events like NASA’s 25 Hours of Thunderhill, where the tough nature of the little car means the 25th hour can look like a Miata parade. Other Miata-friendly road race classes are SCCA’s E and F Production. The 2004-‘05 Mazdaspeed is classed in Touring 3 for the SCCA and looks to have a good chance in that class. The Miata is still a very competitive autocross machine as well. The new STS2 class is designed to make the 1.6 cars run well against newer competition, while the NB cars are still a force to be reckoned with in C Stock as well as C Street Prepared; they took the top spots at the Nationals again last year. Even Street Modified 2 sees Miatas on the podium at the Nationals, although the Corvettes are tough to catch. The pits at just about any track day also have a high percentage of Miatas. They’re forgiving enough to be good beginner cars, but still rewarding for an expert. A Miata on race rubber can surprise a lot of expensive machinery. The Miata story is one of evolution. The 1990-‘97, known as the NA model internally at Mazda, has also been called the M1, and the 1999-2005 cars, known as the NB, have sometimes used the M2 designation, but the M nomenclature has fallen out of favor because that would make the 2006 MX-5 an M3. 1990: This was a particularly long model year, beginning in May 1989, so there are a whole lot of 1990 models around. About 59,000 cars were sold in the U.S. alone, making these by far the most plentiful. The A package added the pseudo-Minilite alloys, power steering, a leather wheel and a tape deck. The luxurious B package provided headrest speakers for the tape deck, cruise control and power windows. Mechanically, all the cars ran the same 116-horsepower engine. A viscous limited-slip differential was a factory option. Colors were red, white and blue, with silver added midyear. The factory hardtop only came in red. The final drive was a 4.3:1. 1991: Mazda introduced the first special edition Miata, a British Racing Green model with a tan leather interior. The delirious public reaction ensured that otherwise-normal Miatas in unique colors would be an annual event. ABS became available on the B package Miatas, an automatic transmission was offered, and Mazda figured out how to paint the hardtop in any color required. Halfway through the year, the nose of the crankshaft was redesigned to be stronger. 1992: Another two special colors! Yellow was an unpopular factory option which went on to become very popular in used cars. A black car with tan leather was also offered. Few real mechanical changes were made aside from a new rear subframe brace. It should be obvious that Miata owners are very concerned with the color of their cars in part because of a lack of other real differentiation. 1993: A new trim package, imaginatively named the C package, made the tan leather interior an option on all cars that were not blue. The Limited Edition for this year was black with a red leather interior. It had a couple of notable improvements: the BBS wheels from 1992 were used, and a different suspension was introduced that used stiffer anti-roll bars, Bilstein shocks, a slightly lower ride height and a functional front air dam. While this suspension was not to everyone’s taste, it was the first time Mazda had offered a suspension upgrade. 1994: The first real mechanical update. Most obvious was the 128-horsepower, 1.8-liter BP-ZE engine. While it was almost identical to the 1.6 it replaced, a new block with greater bore spacing was required. Almost no parts interchanged between the two engines. The ring and pinion was also replaced with the larger and stronger unit used on the RX-7. A Torsen differential was introduced and installed on every car except automatics and the base model. The final drive was changed to 4.1:1. The wheels shed more than a pound of weight, and an airbag was added for the passenger. The R package was important news. Less important to GRM readers was the first appearance of the M edition, which included leather, polished wheels and—gasp—a special color. 1995: No mechanical changes were made, but the option groups were simplified into base, Popular Equipment Package, Leather Package, R package and, of course, the M, which sported some nice 11.6-pound BBS wheels and Merlot paint. 1996: A change to OBD II emissions controls, a lighter flywheel and a slight compression bump to 9:1 meant a power hike to 133 horsepower. The rear subframe brace was dropped from the base models and, of course, a new color was introduced for the M. The ride height on the cars was raised, giving the 1996 models an off-road appearance. 1997: The R package had declined so much in popularity that only 47 were made this year. Mechanically, the cars were unchanged. There were two special editions—big news. 1999: The biggest change yet was the introduction of the NB—a redesigned body, 140 horsepower thanks to a new cylinder head, and a bunch of suspension tweaks. The optional Sport suspension is considered by many to be the best-handling Miata ever sold. In order to meet California emissions standards, some of these cars were fitted with a second catalytic converter right off the head at the cost of some horsepower. The 10th Anniversary Edition came in blue with a blue top, blue seats, blue steering wheel, blue carpet, etc.—but more important was the six-speed transmission and Sport suspension. The top gear of the six-speed box was actually shorter than that of the five-speed. It was paired with a 3.909:1 rear as opposed to the five-speed’s new 4.3:1, so the highway gearing was about the same. 2000: No real changes. The Mahogany SE now came with the six-speed. 2001: Variable Valve Timing was added to the intake cam. Mazda initially claimed a horsepower bump to 155 from this, but it soon became apparent that the horses never made it underhood. Still, the VVT cleaned up emissions enough that the second cat was no longer needed; all models got a tubular exhaust manifold instead. The Sports package came with 10.6-inch brakes front and 10.9-inch brakes in the rear, 16-inch wheels, Bilstein shocks and some new underbody bracing that stiffened up the car substantially at the cost of a bit of extra weight. Projector headlights were added and the styling was sharpened up a bit. The BRG SE had the six-speed transmission. 2002: No change other than an optional six-disc changer. Oh, the SE color? Yellow or titanium. Again, they received unique wheels and all the goodies, including the Torsen and the six-speed. 2003: The big brakes, 16-inch wheels and underbody bracing from the previous Sport package became standard, but the shocks did not. The six-speed became a regular option on the leather LS model, and the Torsen was replaced with a similar one from Tochigi Fuji. A limited run of Club Sport models was offered. These cars had no radio, no a/c, and manual steering (extremely rare on the NB cars). Twenty-five were made with a hardtop and no soft top, while another 25 were made with the soft top. They were an absolute sales disaster. 2004: The final drive on the six-speed was dropped from a 3.909:1 to 4.1:1, which made the car busy on the highway. The big news, however, was the introduction of the turbocharged Mazdaspeed MX-5. It used the 1999 Sport suspension and had an IHI turbocharger bolted to the side of the engine for 178 horsepower. Like other Mazdaspeed cars, the chassis was the best part of the package, but the engine had potential for upgrades. 2005: There were no significant changes to the cars other than new colors. The first impression you get when sitting in a Miata is that it’s a small car. There’s no lounging room in here and the steering wheel can be a little close to the legs of a larger driver. If the top is up, there’s a huge blind spot over your right shoulder. The second impression is that everything is where it belongs. The shifter falls directly to hand and playing with it reveals a direct mechanical feel with a very short shift. The top drops down in seconds and all of a sudden there’s sunshine where there used to be claustrophobic vinyl. Time to go for a drive and see what all the fuss is about. Moving away from rest, the engine does not overwhelm. It’s a willing and serviceable engine, but it’s no Honda mill. Especially on the 1.6, there’s not much going on below 4000 rpm. It does perk up a bit in the upper ranges and the exhaust gives a nice snarl. Any disappointment in the engine is forgotten at the first corner, though. Dabbing the brakes reveals a linear feel without the high levels of assist common in so many new cars. The nose swings eagerly in to the apex, the car seemingly rotating around that tight little shift knob. Playing with the throttle is like having a class in weight transfer, with the car doing exactly what it’s told. Still, it’s no hardship to work the transmission to keep the engine on the boil. The car just wants to play. The NA cars chatter away to you, making sure you know exactly what’s going on as they dance. It’s very involving. The NB cars feel a little more numb and heavier, but if you tackle the same set of bends you discover they’re actually just dealing with pavement imperfections that upset the earlier cars a bit. The truth is that they’re just not making as much of a fuss thanks to a stiffer chassis and more suspension travel. There’s also a little less oversteer in the balance. It’s a faster, more competent car than the NA. In all cases, the gearing makes highway travel a high-rpm affair. 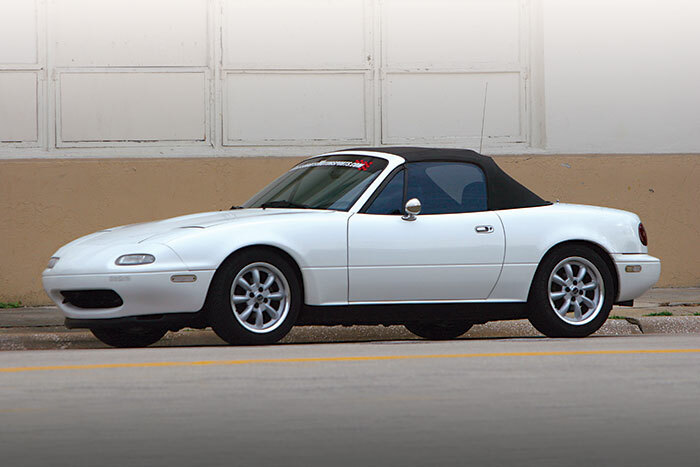 It’s been said by Miata fans that while the NB is a better car, the NA is a better Miata. Regardless, they’re all cars to make you take the long way home and concoct flimsy excuses to take them out to play. It didn’t take long for the aftermarket to discover the potential of the Miata. The first turbocharger and supercharger kits appeared almost immediately after the car’s release. Due to the engine’s competition background, it takes a lot of boost without much complaint. Unfortunately, the turbo manifolds used in the 323 GT/GTX and the Capri XR2 don’t work with the Miata’s packaging, but there are several aftermarket options. GReddy makes a basic turbo kit for the 1.6-liter models that can be built up to high power levels. Flyin’ Miata sells complete turbo kits that are more expensive, but eliminate the need to do your own engineering. If your taste runs to superchargers, BR Performance and Jackson Racing both provide kits of varying performance and price. The engine might be tough and capable of dealing with boost, but it is not all that good at producing naturally aspirated power. On Miatas other than the 1999 and 2000 models, a decent tubular exhaust manifold was used. This means that exhaust, header and intake upgrades will likely not free up more than 10 to 15 horsepower, although the engine will breathe better at the top end. Specific outputs of more than 100 horsepower per liter are possible, but expensive. The most common inexpensive horsepower bump is to advance the timing of the NA models to about 16 degrees BTDC. There’s no shortage of suspension upgrades on the market, but care should be taken not to drop the car too low. The NA models are short on rear suspension travel, and this can cause real handling problems if nothing is done about it. Because most of the Miata’s history has been one of evolution, there is a lot of interchangeability between the years. For the drivetrain, you’ll find everything you need on Randy Stocker’s Web site at www.solomiata.com. Dropping a later 1.8-liter engine into the earlier 1990-‘93 models has become very popular in recent years; kits are available to make this simple engine swap even easier. The head used on the 1999 and 2000 cars is in great demand due to its high flow, and can be fitted easily to the 1994-‘97 engines. The VVT introduced in 2001 makes this more difficult, although there are solutions on the way for that. The transmissions will swap back and forth between all models, which makes it simple to upgrade if a six-speed is desired. Unfortunately, the six-speed is not simply a five-speed with an extra-tall top gear; it’s actually geared lower than the five-speed, so a six-speed swap should be combined with a taller final drive. The rear ends from all 1.8-liter cars are interchangeable as well, and they can even be installed on the 1.6-liter cars if the appropriate driveshaft and halfshafts are also used. The entire suspension from the NB models can be retrofitted to the NA cars, or you can simply swap the spring/shock assemblies for the bulk of the improvement in travel. The brakes got larger over the years, but most Miatas use the same calipers, making brake upgrades simple. Unfortunately, the 2006 MX-5 is literally an all-new design and there are no known interchangeable parts. Overall, Miata engines are tough little critters. High mileage should not be a problem. The biggest concern for many owners is the design of the crank nose in the 1990 and early 1991 cars. If the crank bolt loosens off, the key way on the crank will start to wear rapidly. If this is caught in time, it’s a relatively inexpensive fix with some creative Loctite work. If it goes undetected, the crank can be damaged beyond repair. Many people recommend avoiding these “short nose” cars, but they are very common. Check the crank pulley for a wobble, especially if the car seems particularly low on power when compared to other Miatas. The crank can easily be identified by looking at the front crank pulley: a short nose has four slots, a long nose has eight. Of course, a car with a bad crank nose is an excellent candidate for a 1.8 swap. The NA cars came with hydraulic lifters. These can sometimes rattle badly, particularly if the oil is old and the car is run for short periods. If they don’t quiet down after a couple of minutes of higher rpm running, some may need replacing. They’re about $20 each if you use the identical part from a 1995-‘97 Kia Sephia GS. Noisy lifters can also be the sign of an oil pump with a stuck relief valve, a rare failure on the 1996-‘97 cars. The Miata is more oil-tight than the British roadsters that inspired it, but the car is not immune to problems. The O-ring on the cam angle sensor on the NA models is a common failure. As the oil dribbles down the back of the engine and into the bell housing, this is often diagnosed as a rear main seal failure. Check for oil on the back of the head to tell. The O-ring is cheap and easy to replace. Oil at the front of the engine is typically a front main seal, which can be replaced during a timing belt service. Transmissions are very robust. The five-speed should have a good shift action; if it feels too notchy and the shifter area is warm, it’s probable that the boots around the shift lever are torn and the shift mechanism is not lubricated. Replacing the lost fluid and the boots can be easily accomplished from inside the car in a few minutes and will cost about $50. Six-speeds tend to vary more in shift quality and there’s not much that can be done about it. Stock clutches should last over 100,000 miles, although the clutch slave cylinder has a shorter life. To check the slave cylinder, look in through the passenger’s wheel well. Pull the boot off the slave; if it’s wet inside, the slave needs to be rebuilt or replaced. The Torsen that was introduced in 1994 is a desirable item. The classic trick of putting the car in the air and spinning one tire won’t identify it, though; a Torsen imitates an open diff in this situation. Mazda will be able to tell from the VIN if a car was delivered with the differential, or you can do a test drive: Put one wheel on the dirt and the other on pavement and accelerate hard. An open diff will spin the dirt wheel, while the Torsen will distribute power more evenly. It’s quite probable that the viscous LSD used in the NA models will have lost its effectiveness by this point. The stock shock absorbers generally have a life span of about 50,000 miles. A car with bad shocks will misbehave at the rear, rebounding hard on dips. The Bilsteins used on the 1994-‘97 R package cars last much longer, but offer a harsh ride. Stock bushings are getting tired by 100,000 miles, although this generally only shows up as a loose-feeling car. Rust has never been a big problem with these cars. The earliest Miatas had undersized drain holes in the side sills, and trapped water leads to rust in front of the rear wheels. This rust has to be properly repaired or the car will lose rigidity. Luckily, it seems to be confined primarily to the 1990 models. Check carefully for bubbles or signs of repainting. The factory paint should have a pebbled finish south of the body crease. There are no other significant rust spots, and since many Miatas hibernate during the winter, it’s easy to find a clean example. The white 1990-‘91 cars can suffer from paint delamination. This is not hard to spot. It’s not unusual for the front of any Miata to get a respray due to stone chips. High mileage cars will usually have some damage to the bolsters on the driver’s seat. This is almost inevitable on cars with leather interiors. Unfortunately, the two seats cannot be swapped from side to side. The convertible top should easily last for a decade, but the plastic windows in the NA model scratch easily and can yellow from the sun. Some good plastic polish will work wonders, but either the window or the entire top can be easily replaced for about $350 in parts. Glass windows are available from the aftermarket. Rick Weldon is the owner of PR Motorsports, an import specialty shop in the San Francisco area. An ex-IMSA racer, he is in high demand as an instructor at track days. His favorite tool for the job? A little red 1990 Miata known as the Supersport. Back in 1989, PR Motorsports was well known as an RX-7 race shop. At the time, that model was the car of choice for a guy with a light budget who wanted a fun, tough car. After spending two days demonstrating the brand-new Miata to dealers and the press, Rick remembers, “I was impressed out of the box. I turned to a friend and said, ‘This little thing is going to take off.’” PR Motorsports became the meeting point for a fledgling Miata club and started hosting an annual tech day. Their 16th tech day took place in January of this year. He found a clean 1990 Miata at an auction for $3000 and followed Colin Chapman’s philosophy of adding lightness—only without sacrificing the reliability of the car. The interior was stripped out, the top was replaced with a hardtop found in a junkyard, the side windows were removed, and Rick even spent a Saturday trimming off unused fasteners. This all dropped the weight of the car to a hair over 2000 pounds wet. Flyin’ Miata springs and anti-roll bars were installed along with Tokico Illumina shocks. The engine got a Jackson Racing cold air intake, header and exhaust along with a Flyin’ Miata race radiator. Brakes were upgraded to Hawk Blues in the front and Blacks in the rear, while an Autopower roll bar was bolted in. A set of SSR Competition wheels with 205/50-15 Toyo Proxes RA-1 tires was added. Was the car a success? Rick thinks so. When asked how many track days the car has seen, he answers “Oh my god” and laughs. Some calculations show that the answer is around 80 to 100, ranging from Ferrari club instruction to the many Miata days in the region. Not only is Rick happy to show anyone around the track and harass more expensive cars, he’s a generous guy who usually lets one or two others share his Miata, so it typically runs nonstop for the entire day. This turns a track day into an 8-hour enduro. The car’s forgiving nature and textbook responses make it an excellent classroom for novices, while the robust little motor asks for nothing more than fuel and a bit of oil once in awhile on a long day. The fluids are all changed every three events and the car is driven to the track. Interestingly, this car was being built at the same time the specifications for Spec Miata were being laid down. There’s not a single Spec Miata part on Rick’s car, but the light weight means lap times are similar to a front-runner in the series. Over time, the header has cracked and the 1990 crankshaft showed some wear and has been replaced. Otherwise, it’s every bit the tough little car Rick was hoping for. Keith Tanner works for Flyin’ Miata, a Miata tuning shop located in Colorado. He is also the author of “Mazda Miata MX-5 Performance Projects,” available through many book stores.